This book will help you learn how to build better interpersonal relationships by providing guidelines on how to manage your reactions and how to raise your level of emotional intelligence in a constructive manner. 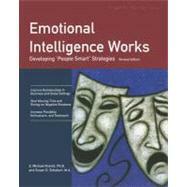 New material in the revised edition includes results from the latest research as well as insight from additional resources on emotional and social intelligence. People who are not emotionally smart waste time on personality conflicts and complaining. They lose self-control when faced with tense and stressful situations. Increasing your emotional intelligence will help you build more positive and constructive relationships and live a more satisfying and productive life.